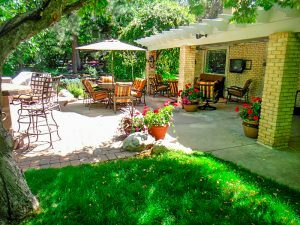 A Perfect Landscape’s professional landscaping contractors have been the top choice for patio installation and custom patio design throughout the Denver, CO metro area for over 20 years. Our dedicated patio installation and design team works with both residential and commercial customers one-on-one to help customize patios that will fit every shape, style, and function. Our local landscaping contractors understand that the Denver landscape sometimes creates unique barriers when it comes to patio installation, such as hills, erosion, and harsh weather. That’s why our certified patio design and installation professionals create stunning patios that will last the test of time, blending with your Denver home or businesses’ current aesthetic and specific landscape requirements. Our valued Denver clients trust our landscaping contractors to provide the most breathtaking patio designs, while ensuring that the patio installation process is simple, affordable, and completed with great attention to detail. Are you looking to spruce up your backyard landscaping and create a place for outdoor entertaining? Add to your outdoor living space with a simple and affordable paver patio and firepit to make BBQ’s a breeze. Are you searching for a breathtaking multi-level patio design that will become an extension of your home or business? A Perfect Landscape installs patios of all shapes and sizes, so there is no patio installation project too great or small for our patio installation team. A Perfect Landscape provides only top-quality patio installation materials, tools, and expertise to offer comprehensive patio design and patio installation services for your custom patio ideas. Paver Patios: Patio pavers are popular because they are the most affordable option, and allow for versatility in patio design and color. Paver patio installation is less complicated and easier to maintain than alternate patio designs, and can be made to fit any size, color, or shape preference to fit your specialized landscaping design needs. Stone Patios: Our patio installation experts can help you bring your stone patio ideas to life, creating a rustic, natural aesthetic with our customized stone patio creations. 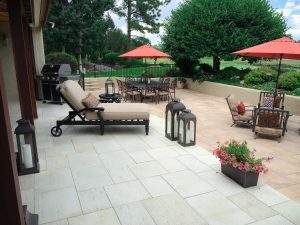 Stone patios are a popular option because they are able to withstand the harsh Denver weather, are fade-resistant, and don’t require staining and frequent maintenance. A stone patio is one of the most naturally durable patio materials. Flagstone Patios: A flagstone patio creates a natural, earthy feel for your outdoor living space. 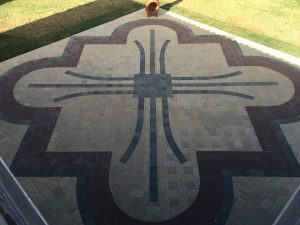 Our flagstone patio designs come in a wide variety of colors and can be customized to fit uniquely shaped areas in your backyard or outdoor common area. Our Denver clients choose flagstone patios because moss or earth can permeate in-between the flagstone sections, thus allowing water to absorb naturally. The unique properties of flagstone patios keep your patio drier, less slippery, and free of standing water after a rainy day. No matter what type of patio installation you need, you can count on A Perfect Landscape’s certified landscaping contractors to provide affordable patio installation and design services without sacrificing quality or workmanship. Contact us today at (720) 851-3034 to learn more about our incredible custom patio installation and design in the Denver area!